Everyone experiences pain at some point, but for those with depression or anxiety, pain can become particularly intense and hard to treat. People suffering from depression, for example, tend to experience more severe and long-lasting pain than other people. The overlap of anxiety, depression, and pain is particularly evident in chronic and sometimes disabling pain syndromes such as fibromyalgia, irritable bowel syndrome, low back pain, headaches, and nerve pain. Psychiatric disorders not only contribute to pain intensity but also to increased risk of disability. Researchers once thought the relationship between pain, anxiety, and depression resulted mainly from psychological rather than biological factors. Chronic pain is depressing, and likewise major depression may feel physically painful. But as researchers have learned more about how the brain works, and how the nervous system interacts with other parts of the body, they have discovered that pain shares some biological mechanisms with anxiety and depression. Treatment is challenging when pain overlaps with anxiety or depression. Focus on pain can mask both the clinician's and patient's awareness that a psychiatric disorder is also present. Even when both types of problems are correctly diagnosed, they can be difficult to treat. In patients with depression or anxiety, various psychotherapies can be used on their own to treat pain or may be combined with drug treatment. Cognitive behavioral therapy. Pain is demoralizing as well as hurtful. Cognitive behavioral therapy (CBT) is not only an established treatment for anxiety and depression, it is also the best studied psychotherapy for treating pain. CBT is based on the premise that thoughts, feelings, and sensations are all related. Therapists use CBT to help patients learn coping skills so that they can manage, rather than be victimized by, their pain. Relaxation training. Various techniques can help people to relax and reduce the stress response. 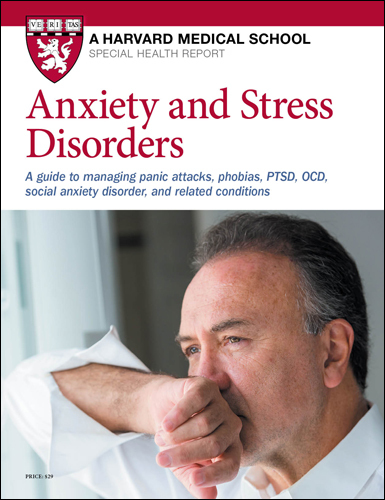 Stress tends to exacerbate pain as well as symptoms of anxiety and depression. Techniques include progressive muscle relaxation, yoga, and mindfulness training. Hypnosis. During this therapy, a clinician helps a patient achieve a trance-like state and then provides positive suggestions — for instance, that pain will improve. Some patients can also learn self-hypnosis. One study showed that hypnosis training reduced both gastrointestinal distress and levels of depression and anxiety in 71% of those studied. Some psychiatric medications also work as pain relievers, thereby addressing two problems at once. Just remember that pharmaceutical companies have a financial interest in promoting as many uses as possible for their products — so it is wise to check that evidence exists to support any "off label" (not FDA approved) uses for medications. Patients may prefer to take one medication for the psychiatric disorder and another for pain. In this case, it's important to avoid drug interactions that can increase side effects or reduce the effectiveness of either drug. Talk to your doctor if you are taking multiple medications. Antidepressants. A variety of antidepressants are prescribed for both anxiety and depression. Some of these also help alleviate nerve pain. The research most strongly supports the use of serotonin and norepinephrine reuptake inhibitors (SNRIs) or tricyclic antidepressants (TCAs) as double-duty drugs that can treat both psychiatric disorders and pain. The findings are more mixed about the ability of selective serotonin reuptake inhibitors (SSRIs) to alleviate pain. All drugs may cause unwanted effects. SSRIs, for example, may increase risk of gastrointestinal bleeding. TCAs can cause dizziness, constipation, blurred vision, and trouble urinating. Their most serious side effect is a dangerously abnormal heart rhythm, so these drugs may not be appropriate for people with heart disease. Mood stabilizers. Anticonvulsants are also sometimes used to stabilize mood. These medications exert their effects by constraining aberrant electrical activity and hyper-responsiveness in the brain, which contributes to seizures. Because chronic pain in particular involves nerve hypersensitivity, some of these medications may provide relief. Is krill oil better for the heart than fish oil? A. Krill oil is extracted from the bodies of Antarctic krill — tiny shrimp-like shellfish — and can be taken in capsules. Like fatty fish and fish oil supplements, krill oil capsules contain the omega-3 fatty acids eicosapentaenoic acid (EPA) and docosahexaenoic acid (DHA). Consuming these fatty acids (and alpha-linolenic acid, or ALA, which is derived from plants and converted in the body to DHA and EPA) is associated with a reduced risk for cardiovascular disease. There's little research on krill oil supplements. One product, Neptune Krill Oil, has been shown to improve cholesterol and triglyceride levels and to decrease hs-CRP (a measure of inflammation that's important in cardiovascular disease). But studies lasted only three months, so long-term effectiveness and safety are unknown. Fish oil in high amounts increases bleeding risk; thus it's likely that krill oil does, too. This can be a problem if you take medications that slow clotting, such as warfarin (Coumadin), clopidogrel (Plavix), aspirin and other nonsteroidal anti-inflammatory drugs, and certain herbal supplements (for example, St. John's wort). Krill oil may have benefits, but for now it's best to rely on omega-3 sources that have received greater scientific scrutiny, including fish, fish oil, and plant sources of ALA. The American Heart Association recommends that healthy adults eat at least two servings per week of EPA- and DHA-rich fish, such as salmon, herring, mackerel, sardines, and albacore or bluefin tuna. People with heart disease should consume 1 gram of EPA plus DHA daily from fatty fish or fish oil supplements. Heart experts also recommend getting ALA from food sources such as soy products, flaxseed, walnuts, and oils extracted from flaxseed, canola seed, olives, walnuts, or soybeans.